Enjoy the journey — Always look out the window and mark the spots where you’ve been. It was a simple note. Sitting on the other side of its glossy cover. I started flipping through the pages, full of green, blue and orange. Jagged streets; red blue and black. Full of interstate highways, cities, towns…places I’d never been and places I was going. Inside, I was filled with warmth in adventure. 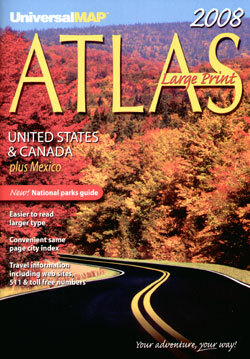 I put the atlas in my purse to read through it on our descent into Florida that evening. Sure enough, my stomach felt the first hints of dropping and I excitedly pulled out the atlas and flipped eagerly into Florida. We were flying into Fort Myers and I knew we would be cruising along the coast. The sun was dropping dramatically in the west and the horizon was black on a fiery orange–sandwiched in between an oddly fresh blue. I tried to take a picture with my cell phone and like usual, it couldn’t capture its depth and drama. I positioned my atlas so the coast was facing away from me. I looked out the window toward the ocean. I could see the deep indent in Tallahasse. I could see St.Vincent Island push further away from the last piece of land. I felt like the only person in the airplane who knew where we were (aside from the pilots). I felt secretly worldy. I felt like I was going somewhere. And way up there in the sky, I felt like I knew where I was going. My feet were planted firmly on the hallow plane floor. And for once, it felt steady. I highlighted Fort Myers, Punta Gorda and Lakeland Florida on my road atlas. Because we were heading quickly toward a 3-day layover there. I scanned through the rest of the map and highlighted Washington DC, Las Vegas, Boston and Seattle. I couldn’t wait to highlight more. And I couldn’t wait to fill the map with neon dashes. As we came closer to ground and city lights started protruding from dark chasms of earth, I pressed my face against the cold window. Condensation ruined my peripherals but I took it all in. Although plane windows are small, I wanted to remember to always look out them–and never forget where I was. When you travel a lot, it’s easy to forget that you are in an entirely different city. I was thousands of miles away from home and my road atlas was going to stand as a reminder. Of how much more world I was going to see than the average person. My insides tremored in excitement. I nodded to myself. I was choosing mine. And it was a fancy and colorful array of winding streets, wind, stories and substance. Tasty. ← I’m Not a Cat Lady, But I Love Kittens!